The circus is coming to town, and we've arranged for Aquarium members to receive a special discount! The Big Apple Circus is set up the on City Hall Plaza until May 10—just a short walk from the Aquarium. This year's theme—Metamorphosis. 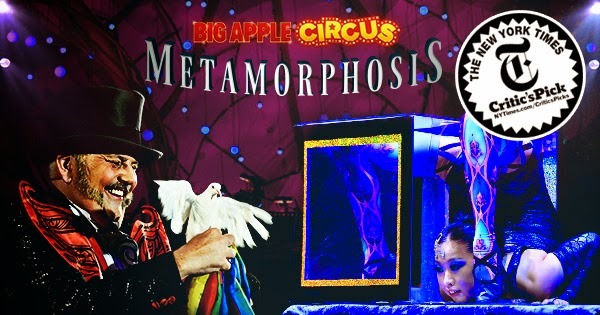 Members get discounts to the Big Apple Circus's Metamorphosis show! During this exciting show, no one sits more than 50 feet from ringside as you watch the flying trapeze soar, the razzle-dazzle of the Rolla-Bolla, the dynamo of the Diablo, the risky rhythms of the Risley team, the cunning conjurors of the Quick-Change, and the incredible flexible limbs of the Contortionists. See and hear the musical merriment of our featured clown and camels, horses, playful pooches and more. Tickets are available online on the circus's website. Just be sure to enter the coupon code BACBOS to receive your 25% discount!